FILE: Thursday, June 21, 2018, Fans wait on the concourse at Parkview Field during a rain delay before the start of the TinCaps' game against West Michigan. The game was postponed until the next day. The TinCaps open their final home series of the season today and with just three games remaining at Parkview Field, they are likely to finish third in the Midwest League in attendance, drawing in excess of 370,000 fans for the downtown stadium's 10th season. It's a mark of how high the bar has been set for attendance at Parkview Field that that lofty figure registers as slightly disappointing. The TinCaps have drawn well this season, as they have every year since the ballpark opened. They simply haven't reached the levels they achieved the previous several years. Weather has been one of the key factors driving the lower attendance this season. The season began with a number of April home dates that were bitterly cold; of the team's 12 April home games, seven had high temperatures at least 8 degrees colder than the historic average high in Fort Wayne, according to data from www.accuweather.com. Once the weather warmed up, the rain began. 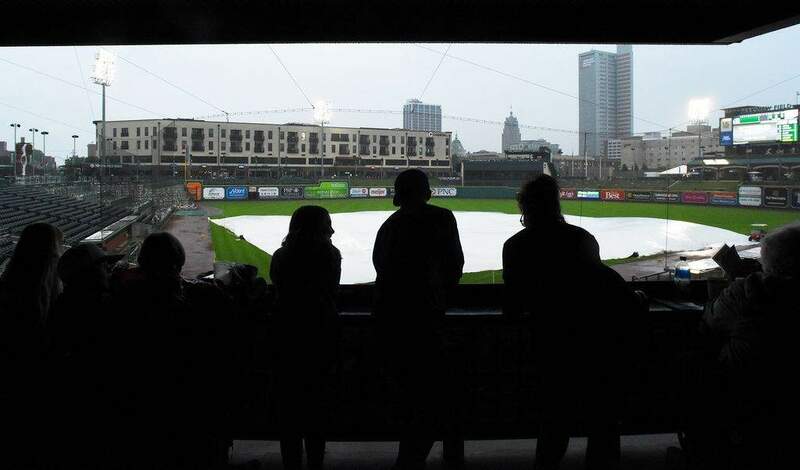 The TinCaps had four home dates rained out this season, the most ever. The team doesn't count attendance for those games, so those lost dates have contributed to the slightly falling attendance. The team never had a game at Parkview Field rained out in July or August before this season, but they had two this year. Thanks in large part to those weather problems, the TinCaps will draw fewer than 400,000 fans for the first time since 2012, and there is a good chance they will finish with the lowest attendance since Parkview Field opened in 2009. Even their per-game attendance, which sits at 5,639 entering today's game, would be the third-lowest in their 10 seasons. Still, Nutter sees a positive trend for the team outside of the assorted weather issues and said all his indicators at the beginning of the year, such as season tickets, group plans and birthday parties sold, pointed to a season in which the team would easily draw in excess of 400,000 fans again. Yet despite failing to draw as well as they have in recent seasons, the TinCaps are still among the best-attended low-level minor league teams. They are third in all of A-ball – which encompasses seven leagues – in attendance and have had higher per-game attendance than 23 of 29 Double-A teams and 10 of 30 Triple-A teams. In addition, the team drew very well when the weather was good and those large crowds got to see some exciting games. On the Fourth of July, more than 8,800 fans packed Parkview Field and watched Padres No. 2 prospect MacKenzie Gore pitch six shutout innings in a rousing 7-0 victory over Great Lakes that moved the team into first place. “Nights like that can kind of fool you into thinking it's almost a big-league setting,” TinCaps broadcaster John Nolan said. “You have a special talent like MacKenzie on the mound in that spot, not to mention the rest of our team, a standing-room-only crowd. Note: Tickets for possible TinCaps playoff games are on sale at www.TinCapsTickets.com or by calling 260-482-6400 to purchase seats, which will be refunded if the team misses the playoffs.